Everything you’ll find on Backyard Banter is analysis based; the fruition of dedicated film study. In this piece, I’d like to take a step back from that, and tell a story. For days I knew it was coming, but that didn’t make it any easier to read the words “The Panthers have released Steve Smith” today. With one fell swoop; Carolina released, without a doubt, the best player to ever don the black and blue. For those that don’t know, I am something of a Carolina Panthers fan. The Harmon family settled in North Carolina hundreds of years ago. Most of my relatives still live less than an hour outside of Charlotte. I drive a jeep with a big Panthers’ logo covering the spare tire. Jerseys, tickets to games, and countless other Panther related objects were regulars as holiday gifts. I’ve seen a lot of bad and some good over time, but never once thought about cheering on another NFL team. When I reflect on Carolina’s history there are so many players to remember fondly. How could you not love what Sam Mills, Stephen Davis, Mike Minter, or Jordan Gross brought to the team? Jake Delhomme crashed and burned at the end, but don’t forget the days when he was the unheralded savior of the Panthers. Even now there are great players like Luke Kuechly, and one of the best young quarterbacks in the game. However, there is one Panther who stands above the rest, and that player is no. 89. The third round pick out of Utah rose up from being an obscure kick returner, to one of the best receivers in the NFL. In the 2005 season he took home the metaphorical “Triple Crown” by leading the NFL in receptions, yardage, and touchdowns. In his prime Smith was an elite player, and did so despite his small stature. Smith played every down like it was his last, and dominated at the catch point like a 6’5” receiver should. He is such a unique player, and there might not be another receiver out there like him. Even when Smith was making headlines for punching teammates, or being demonstrative the media still loved him. When he lashed out at Rams’ cornerback Janoris Jenkins, everyone took 89’s side. He’s beloved, even when he was a “villain”; Steve Smith is just that cool. For many years, he was about the only thing Panthers’ fans had to be proud of. Given his stellar play, the fact that his name is all over the team’s record books, and what he meant to Carolina; Steve Smith is the best player in franchise history. Steve Smith welcomed the crown, and still wears it to this day. He was a Panther to the end. After Carolina’s disgraceful 2010 season, the still productive Smith was given the option to leave the team. 89 stayed home. He wore his heart on his sleeve and almost always backed his talk up with breath-taking plays, and we the fans love him for it. For many years he was really the only thing that made Carolina relevant. So, that brings us back to me. I haven’t been the same fan since Jake Delhomme’s meltdown against the Cardinals in the 2008 playoffs. I was a senior in high school that season, and it was the first time I was really old enough that I could join my team on a high. I talked trash, I felt they’d win every game, and you couldn’t shut me up about “double trouble”. Unfortunately, just like with all highs, it came crashing down. I was crushed when, after earning a first round bye, the Panthers were forced to take an early exit, and mostly at the hands of the best quarterback they’ve ever had. It didn’t help matters that the two years to follow featured more horrific performances, and the dreadful Jimmy Clausen year. 2010 was the worst, and most disgusting thing I have ever watched. Hell, the first time I had an opportunity to go to a Panthers’ game was week five of that season. The first time I saw my team play live I witnessed them be dismantled at the hands of the departed Julius Peppers and his new Bears’ teammates. Sure, I have enjoyed the Cam Newton years, and I stand by him. He has made the Panthers a national story again, and has been an exciting watch. Yet, it was still all too painful watching the Panthers suffer the crushing, down to the wire defeats that were a staple of Ron Rivera’s first two seasons. 2011 and 2012 didn’t bring me any closer with my team again; it hurt me more to know they finally had a real quarterback, and would still let me down. Finally, early this September, my fandom was pushed to its breaking point. My personal life was in shambles, and I was in the midst of an all-time low point, after just coming off a mountaintop of happiness. When in week two of the NFL season the Panthers blew yet another lead—in the closing seconds—to the Buffalo Bills, I decided enough was enough. I walked away from the TV that day without feeling a single emotion; something had changed. Life was throwing me enough challenges. I didn’t need some football team I wasn’t a part of bringing me additional pain every week. So the dreaded “fan apathy” set in. I would still support the team, and want them to win, but I felt nothing towards them. I wouldn’t hurt when they lost, and I wouldn’t feel joy when they won. We’d stay together, but sleep in separate beds, and have a loveless marriage. It wasn’t that big of a switch for me. I’m not an overly excitable guy—ask any one of my ex-girlfriends. They’ll tell you all about that “glaring personality flaw”. I don’t show my excitement well, because I don’t jump for joy, or go on and on about how much fun I’m having. I can express my feelings, but it’s more about words, than visceral reactions, for me. Likewise, as a fan, I never screamed at the TV, or cheered the loudest in the stands. No way did I ever do something like paint my face or tweet “#KeepPounding”. I’d show you how much I cared about the Panthers, or talk about them from dawn to dusk, but you’d never see me lose my mind. It was also during that low point that I decided to put a ton of effort into my work here at Backyard Banter. It provided a great escape, and gave me something to be proud of. If I could somehow become good enough to make a career as a professional NFL writer and analyst, that would be even better. It was time to move away from life as a fan and embrace being an emotionless observer. I’m still not sure if you can be a diehard passionate fan and remain fully non-bias in covering the NFL, especially your team. You can still have a favorite team, as I do, but you cannot be so passionate that your judgment is affected. I would challenge anyone to read my work here, at Draft Mecca, or anywhere else I write, and find an area where my objectivity was compromised. I don’t think it has. But can you be a true fan with that mindset? I’m equally as unsure. It's why I don't know what to call myself, really. The path to apathy was an easy one for me. Even as the Panthers went on a crazy ride to the playoffs while riding an eight game winning, I knew it was too late. I thought “Riverboat Ron” was fun, and I still went to a Panthers’ game this season, but it didn’t feel the same as it used to. I was free from the pain, but also didn’t feel the highs. That is, of course, with one massive exception. Steve Smith is my favorite NFL player. Ever. It isn’t close. He was tough, he was fiery, and he was a phenomenal football player. Whenever I was laughed at for being a fan of the Panthers I could always say “yea but, Steve Smith” and it would all be okay. Smith's reckless ways, on the field and in the media, were always endearing to me. I don't mind guys who mix it up and talk, as long as they are great players. Smith was the kind of player who makes football fun, and in the sometimes too robotic NFL, we need that. Even through my apathy this year, I still felt for Smith. I loved seeing the Jenkins tirade and the show of that classic Smitty “passion” in the post game press conference. I reveled in “Ice Up Son” and anytime 89 would make a play. Nothing was better than seeing my favorite player battle back from a PCL sprain to play in the Panthers' playoff game. Well, seeing him score on a long touchdown pass in that contest was quite cool as well. There’s a picture hanging in my apartment featuring several—all now former—Panthers’ players. It depicts Steve Smith in the upper right hand corner. I have cringed every time I glanced in its direction over the course of the last three days. Watching my favorite team release a player I care so much about has been a terrible experience. As an analyst, I completely understand why the Panthers released Steve Smith. As a fan, I hate it. The circumstances around Steve Smith’s release are odd, but this decision comes back to football. Panthers’ fans don’t want to admit it, but Smith is a declining player who has seen his speed rapidly erode in the last year. He was not productive enough to justify his salary. He can still play somewhere next season, but he might not have much to offer. Still, that doesn’t mean I wanted him to leave. As an analyst, I am happy the Carolina Panthers have a general manager who can make the tough, and emotionless football decisions required of him. As a fan, I am angry that Dave Gettleman cut my favorite player. By all accounts the decision to release Smith was based on Gettleman’s relationship with Smith, and the direction of the team. He viewed Smith as an expendable non-asset, and that’s all there is too it. Fans can hate Gettleman, but I promise you he doesn’t care. He knows you will still be at the games, and helping fund the business come opening day of next season. You might be mad at Gettleman’s choice, but it doesn’t matter. He’s an older man holding a position with an extremely short shelf life. Gettleman doesn’t have the luxury of taking your feelings into consideration, because winning games is the only way he will stay employed. The Panthers’ general manager believes the best way to build a long-term, successful team was without Smith around. It’s his prerogative to execute that plan. Could he have handled this better? Absolutely. In fact, he probably couldn’t have handled this any worse. In the end, Gettleman knows that in a few years time, none of this will matter. That’s why he is the right man for the job. We as fans offer ourselves up for this toil when we put our emotions into football. In all walks of life, human beings can’t resist getting hung up on things that are so beyond our control. Supporting an NFL team is one example chosen by many. It pains me to write negative words about Steve Smith; it really does. I wish he could have ended his career as a Panther, but that dream is dead. Instead, I hope my favorite player goes to another team soon, signs a nice deal for his family’s sake, and wins. Go to the Ravens, Smitty. 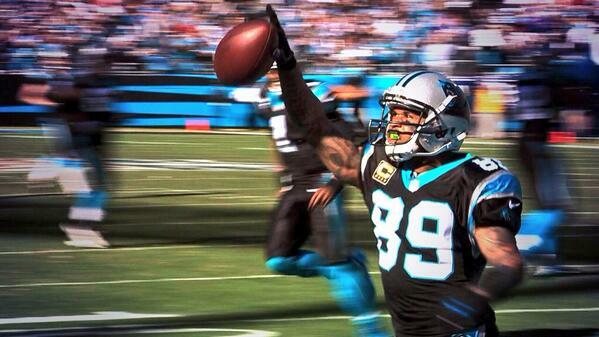 Don #89 again, ball out, win a Super Bowl, and prove the Panthers wrong. I hope it happens, and I know I’ll feel something if it does. Thanks for everything, Steve Smith. As fans, we couldn’t have asked for anything better from you. Thanks for the wins, the fun, and giving us some bragging rights. I wish it could have ended better. You will be missed.